Once the school year begins, and the “train” leaves the station, it seems like I don’t have any time, inclination, or energy for a big project around the house. For ten months I struggle with the enormous piles of essays, tests, and quizzes that befall a middle school language arts teacher. About all I can manage around the house is cooking dinner each night and doing the laundry on Sunday evening while I do my lesson plans for the next week. At the start of my eight-week summer break, I wander around in a daze unable to commit myself to much of anything, even the laundry, other than reading (for pleasure as opposed to reading for school), cooking, and baking, three things I find truly relaxing. Eventually, however, it dawns on me that the summer is slipping by and I buckle myself down to tackle a project. Because we are a houseful of avid readers, and by avid I mean obsessed, one of my first projects last summer was to make room for the overflow of books that is the result of (a) one college graduate moving back home with her boxes of books and (b) the whole family’s favorite weekend forays to the two excellent used bookstores in our neighborhood. We all regularly give and get books as gifts, and we actually use Amazon gift cards to purchase, surprise, books. 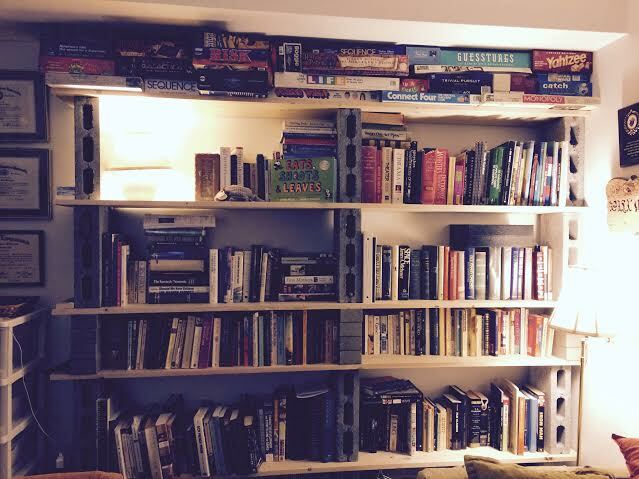 Unpainted planks and concrete blocks from the local hardware store and voilà, an entire wall of bookshelves. I know it would have been nicer to purchase bookshelves, or hire a carpenter to build some, or at the very least, to sand and paint the planks, but once the shelves are filled with books, the beauty of the spines of the books and their jackets seems to take over and elevate the whole thing to an acceptable point. My next major project was to go through my closet. This is a much more monumental task than finding shelf space for books. Books are my friends, and no matter how old they are, or how many times I have read them, I can always pull them out and read them again. However, some of my clothes stopped being my friends years ago. Some items were impulse buys, and once home, decided they were loners and did not wish to see the light of day. Other items were once cherished BFF’s, building me up and making me shine, and now they taunt me instead, unwilling to zip or button or match with anything that does zip or button. This surliness has even spilled over onto my shoe racks. That beautiful pair of bone pumps, with the pretty kitten heels and the stylish brushed nickel buckle across the rather pointy toes, has turned into a mean and spiteful set of twins who tease me by taking nips out of my little toes every time I wear them. It was time for me to “unfriend” some of these hangers-on and free up valuable closet space for new friends. This seemed like a one day job: take everything out of the closet, inspect it, try it on, and either hang it back up or fold it for the donation box. Ha! One day my foot. Speaking of feet, the shoes alone took a whole day. So many painful decisions. I finally decided on the only reasonable method of deciding to keep or pitch: could I survive a day teaching in that pair of shoes? Strappy sandals, no way! Red clogs purchased in Holland (but ironically say “Made in Sweden” on the bottom), uh-I don’t think so. This made all further shoe decisions extremely easy. Day two: jewelry. Seriously, you would think I was a member of the British royal family with all the pins and brooches I have collected over the years. Don’t get me wrong, I love my pins and brooches. I wear one almost every day. Some I have had for thirty plus years. Others I bought because they reminded me of a particular piece of literature and I wear them when I teach that book or short story. What? You don’t understand? Well, in a thrift store I once found a burnished gold brooch in the shape of a marlin, as though it were leaping from the water, back arched and scales glistening in the sun. I just had to have it, I mean, for goodness sake, I teach Hemingway’s Pulitzer Prize winning novella The Old Man and the Sea. 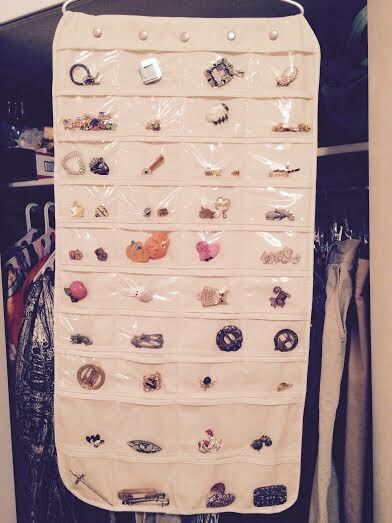 So you can see how sorting and organizing my extensive collection of costume jewelry would be a day in itself. Day three: scarves. Okay, now you probably have an image of someone your grandmother’s age, or older, swathed in some smelly old Victorian printed piece of gauzy material, but I can validate how my love of scarves began. Years and years ago my mother’s great uncle died and when her family went through his belongings they offered my mother one of his ancient leather suitcases, embellished with his initials in gold leaf near the handle. When we got the suitcase home and opened it, we were surprised to find inside items left behind by his wife, not him, a small sandwich baggie filled with costume jewelry, some of it marked with well-known names such as Monet, Napier, and Sarah Coventry, and a collection of silk scarves. My mom gave it all to me and gave the suitcase to one of my cousins who had been named for this great uncle. 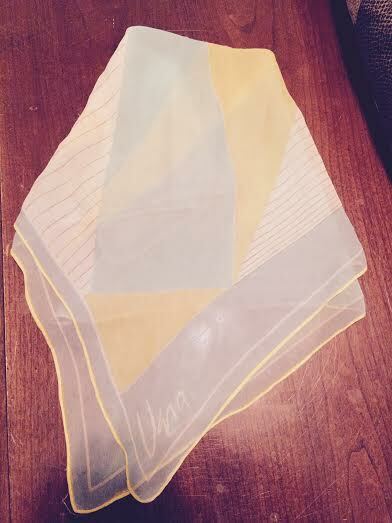 And so my love of scarves began. A plain knit top becomes an outfit with the addition of a scarf and a brooch. Perhaps not as fashionable as in the past, I still love to accessorize with these items, and my collection of both scarves and brooches has continued to grow. Day four came and finally it was time to tackle the clothes. This was undoubtedly the hardest day as some items have such sentimental memories attached to them. There’s the knit top purchased at a Gap store on the day it first opened, and I had negotiated the legal documents between the landlord and the tenant for the build-out of the store. As a result of my work on the deal, I was given an employee discount card for one day and was able to shop in the store before it opened to the public. I loved that shirt. I wore it all the time. I have a charming picture of my family taken on a summer vacation to Williamsburg with me wearing that top. It has seen its better days and frankly, doesn’t fit anymore, but for years, when I attempt to organize my closet, I just can’t bear to part with it. There are other items like that. A brown denim maxi-skirt appliqued with bits of corduroy and plaids in a swirly pattern down one side is another example. During the two years we lived overseas I didn’t purchase much clothing in the stores on the local economy as we were able to have shipped to us American goods via the APO system as well as being able to shop at the PX and commissary near Brussels. In addition, the European tight-fitting clothing didn’t quite agree with my all-American (for better and worse) body-type. But, one day, in a mall in Brussels, I found this brown denim skirt and by some miracle, the largest size fit me. I absolutely adore that skirt (still) and wore the daylights out of it until it turned on me and decided not to zip one morning as I was dressing for work. I can’t give that skirt away, even though it has betrayed me; I just can’t. So, on that day I made a decision to make a small stack of clothes like the Gap shirt and the brown denim Belgian skirt, and pack them into a box marked “Keepsake Clothing”. Now, they can’t taunt me from their never-touched coat hangers and I actually have room in my closet to see what does fit! About halfway through the clothing process I stumbled upon a black zip-front cardigan that had been my mother’s. She wore it all the time as she was always cold as she grew frailer from the illnesses that plagued her for the last fourteen years of her life. In 2007 when going through her closets after her funeral, I found that cardigan and had a good cry while holding it close to me. That day I packed it in my suitcase and hung it in the back of my closet when I got home. 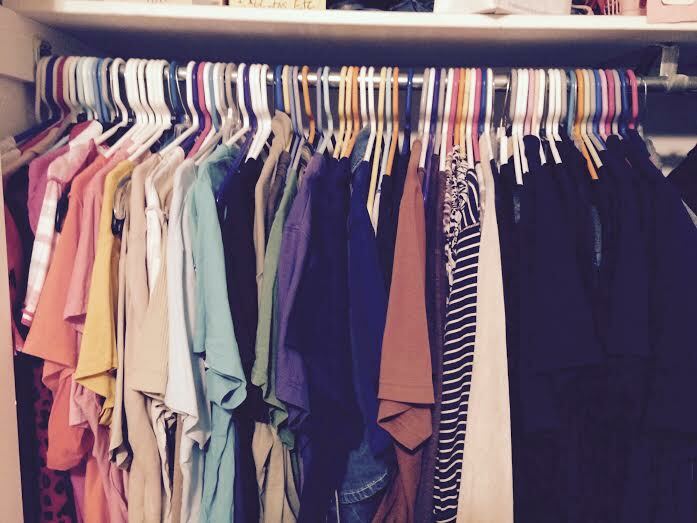 Seven years later, I was overwrought with emotions once again as I took it from the closet. I had to sit on the edge of my bed and hold that cardigan, and yes, have a good cry. It was shabby from much wear, and one shoulder seam had become frayed. It wouldn’t fit anyone in my family and looked so dated I am sure it wouldn’t be worn by someone that it did fit. That cardigan is not my mom; it can’t bring me closer to her or do anything other than make me sad when I look at it. So I did something my mom would have advised: say a Hail Mary, wipe my eyes, and put it in the donation box. Just before I did that, though, I checked the pockets and there I found two clean tissues, a packet of Equal sweetener, and the balled-up wrapper of a Hershey’s Kiss, with its little paper tail sticking out. There you have my mom in a nutshell. Tissues always at the ready, and because one of her medications had brought on Type II diabetes, she used Equal in her coffee and tea. Type II diabetes, however, wasn’t strong enough to ward off a little bit of chocolate here and there. Sadly, after four days I was still not finished with the reorganization efforts in my bedroom. I still have a large drawer crammed full of socks. Oh the stories those socks could tell if they had tongues instead of toes. But, I have run out of steam on this project, and it is almost “back to school” time for me. The remainder of my time off will be devoted to cleaning and decorating my classroom, organizing my teaching materials, going through my school library, throwing out student work not collected at the end of the year- -a lot like organizing my closet at home. Besides, in the dead of summer, who wants to sort through matched pairs of socks, mismatched pairs of socks, and sock widows and widowers? I think the stories from my sock drawer will have to wait until next summer.